Plenty of products found around the homestead are powerful and effective cleaners for your shoes. Some simple home remedies for shoe cleaning can come in handy when you’re in a pinch and don’t want to spend an arm and a leg. We think that to clean his pristine blue suede shoes he would have used a light amount of water. Wet the entire outside of the shoe with a firm-bristled toothbrush and then blot dry with a cloth. For dust and dirt, simply brush the suede out as the fibers become stuck in one direction. If you are trying to remove gum or wax, place the shoe in the freezer and eventually, the gum or wax will become hard and simply chip off the shoe. Whether you’re on the court or on the field, nothing says your ready to go like a crisp pair of sneakers. For sneakers that are made mostly of plastic or vinyl, the power of peanut butter comes into play. 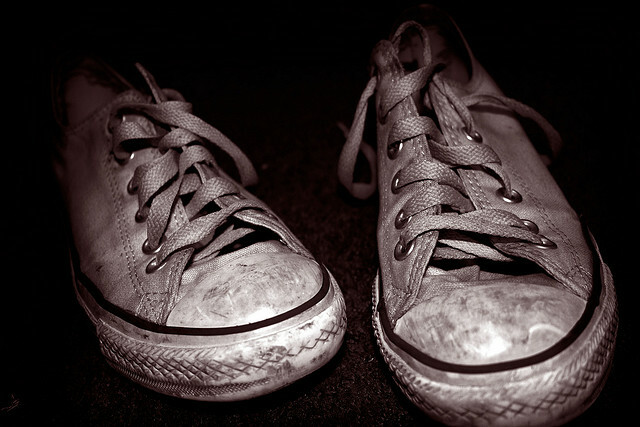 Apply a healthy amount to your sneakers and allow the natural oils to remove oxidation stains. Be sure to use creamy and not chunky — the chunks of peanuts could actually scratch your sneakers beyond repair. When it comes to leather shoes, one thing must be taken into account before anything else: is the leather finished or unfinished? Untreated leather requires special polish and cleaners whereas treated leather does not. Most shoes are treated and finished, however. Finished leather — Using a soft brush, remove excess dirt and buildup. Then with a lightly-damped cloth, wipe the surface of the shoe, going with the grain. Unfinished leather — For unfinished leather, use saddle soap in addition to water. Let the shoes air dry, but not near a heater. That may cause shrinkage and cracking, doing irreversible damage. Sometimes the simplest fixes are found in the places we least expect them to be. Follow these simple at-home shoe cleaning instructions and you’ll never be worried about not being completed from head to toe.